Transport loads up to 500 lbs. and do it in tight quarters where you could never take a trailer. Power driven wheels do the hard work. Three forward speeds and one reverse make it easy to maneuver. One-piece molded bed is great for fine or wet materials that need to stay contained. 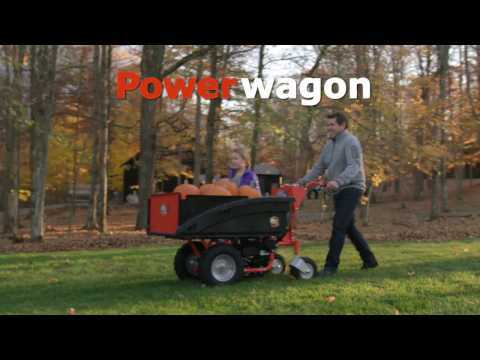 Powered Hauling Makes ALL Your Projects Easier! 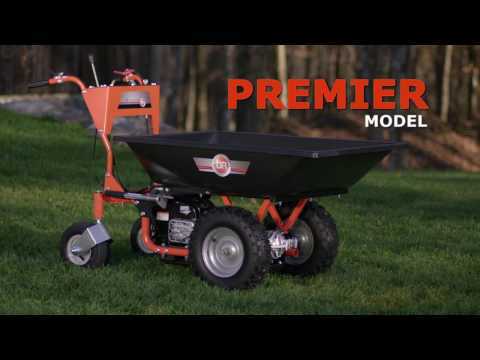 The PREMIER Powerwagon, with its easy-starting Briggs and Stratton engine (6.75 ft lbs torque), makes hauling loads of up to 500 lbs easy, even in tight quarters. It centers the load over the two big, power-driven wheels to propel your load up slopes or over uneven terrain. With 6.75 foot pounds of torque (163 cc) this engine will power loads of up to 500 lbs with ease. It’s easy to start, comfortable to use, and features a debris management system that protects the engine from whatever you kick up while you’re cutting. Works well but dump handle needs work. I had to grind the stopper down for latch to fully engage to keep from losing full loads of topsoil. Built well, runs well, love it! Big toys for big boys. I live on a hill and primarily use it for hauling cord wood up to the back of my house. Very maneuverable in tight spaces. I'll be hauling rocks and dirt next. CAUTION.....DON'T FORGET TO RELEASE THE BRAKE!!! I did it twice over short distances. This thing is so powerful it will smoke the brake. The power wagon is excellent! Used it many times in the first three weeks. Had difficulty fitting the bed to the arms. Had to take the arms off the machine and attach them then attach a whole assembly again. The holes Didn’t lineup for the four main bolts. After removing the rubber in the caps off the arms everything fits together. Would recommend this power wagon to anyone who has a lot of heavy loads to move. I love my new Powerwagon. It makes the job much more tolerable and is easy to operate. this was a great purchase and a pleasure to operate. Really great piece of equipment. Rugged construction, easy to operate, and very useful. This machine surprised me by how truly useful it is. It has made many jobs an awful lot easier. Our two acre property is wooded and gently sloping, but not large enough to justify purchasing even a small tractor. The DR Powerwagon is perfect for moving firewood rounds from the lower area or our land to the higher ground where they can be split and stacked in the woodshed. It is also very useful for moving dirt and rocks. Even large stacks of lumber for outdoor projects such as deck building. This wagon is amazing. It delivers what it says it will do. Very easy to use. The dump feature is great and easy. The wagon is very maneuverable. Easy to start. I had some doubts when my husband bought the wagon, however, I am now a convert. It is well worth the money spent. This is likely the best purchase I have made since the purchase of my Dual Action DR Wood Splitter. I use the Powerwagon for everything from carrying wood to hauling rocks to transporting tools for work on the house. It has been extremely reliable and when I did have a problem, I called Customer Support and was walked through the fix and it was running again in minutes. If you need a reliable wagon to move things around uneven property, this is the ride. I love this machine and am using it in the mountains to haul firewood and rocks. It is a solid built, great machine. I will enjoy this back saver for a long time. Outstanding machine for the homeowner with a large piece of property. I have hauled mulch, firewood, stone, yard debris, and construction debris. I should have gotten the machine ten years ago. My back would be in good shape today! I own a Powerwagon that is almost 15 years old. I use it for construction projects in places where I cannot get large equipment, and let me tell you, it keeps on going. I have been so happy with DR products that I just purchased a Vers-Trailer for my ATV. Customer service is excellent and you cannot go wrong with this product or other DR products. Q.How fast are the different speeds? Q.What will happen if I hit a rock? Q.Can this be unloaded with one hand or is it a two handed process?